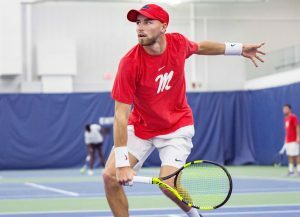 Ole Miss Men’s Tennis extended its hot streak with two 4-0 dual match wins over a winless Alcorn State squad this weekend. Coming off of a nail-biting 4-3 win over No. 20 Oklahoma State in Stillwater, Oklahoma, the Rebels delivered dominant performances in their final tune-up matches before conference play. In the first match, the duo of Cotter Wilson and reigning SEC Player of the Week Fabian Fallert made quick work of the opposition, winning 6-0 in the first doubles match. Tim Sandkaulen and Karlo Kranic soon followed with a 6-2 decision to win their doubles competition and give the Rebels a 1-0 lead. Singles competition in the first match went just as well as doubles for the Rebels, with three quick wins finishing around the same time. Freshman Simon Junk was the first to finish, with his 6-2, 6-0 victory pushing the Rebels’ lead to 2-0. Wilson and Sebastian Rios finished shortly after to secure the win in the first match of the day. The second match started with singles completion. The Rebels won four of the six matches to complete the sweep. Kranic and Wilson didn’t lose a single game in their matches, and Rios won his match handily. Sandkaulen then clinched the final point of the weekend with a 6-0, 6-4 win. The two wins over the weekend give the Rebels a 5-3 record overall and a perfect 4-0 record in Oxford. With a true road win over a ranked Oklahoma State and this weekend’s dominating performances, Ole Miss has real momentum heading into the meat of the season. Wilson and Fallert have fueled Ole Miss’s streak. After the weekend, Wilson extended his record at home to 4-0. Fallert, a senior from Lichtenstein, was named SEC Player of the Week after his clutch win to secure a victory over Oklahoma State. It’s the first time Fallert has been honored with the award. Wilson and Fallert are 3-0 as a duo and helped win the doubles point with a 6-3 victory. Fallert, with the match tied 3-3, delivered under pressure and fought through a first-set tiebreak to win the match-deciding point for the Rebels, 7-6 (13-11), 6-2. The next challenge for the Rebels will come the weekend of Feb. 22 when they will travel to Montgomery, Alabama for the Blue Gray National Tennis Classic. Among the teams competing are Alabama, Arizona, Auburn, Fresno State, Princeton, Rice and Texas Tech. The Rebels have yet to win a match at a neutral site this season, so the recently gained momentum will be much needed when the team heads to Montgomery. After the trip to Montgomery, the Rebels will face their first conference competition when Kentucky visits Oxford March 1. The Rebels have 14 matches left before the SEC championships in Gainesville, Florida, on April 17.